To our ambitious breeders we offer Congress, one of the most promising sons of Cornet Obolensky, whose damline of Rudilore is full of performance potential. The new dream team is called Congress and Marie Ligges. In her first sporting season as a junior rider, the pair achieved success up to advanced/S* level, and an 8th place at the German Junior Championships in Zeiskam. Congress was licensed in 2008 in Münster-Handorf. His first time at stud he spent at the NRW public stud in Warendorf. In 2009, he finished his stallion performance test in Warendorf and finished in 4th place in the jumping index. For jumping ability he was given a mark of 9,5. 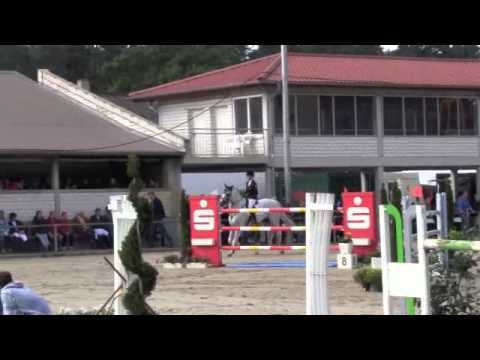 In 2010, he was placed in young horse show jumping competitions. The progeny of Congress has a fantastic sporting attitude. In 2014, Chakira TF won the Westphalian free-jumping competition and received a mark of 9,5 for scope and a 9,1 for manner. 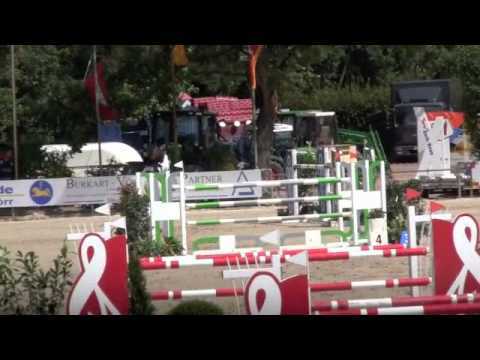 At the German Elite-Mare-Championships in Lienen she placed 6th among the show jumping mares. Fourth place went to the Congress-daughter Carissma, which made it to the finals at the Westphalian elite-mare-show. Congress was sire to Casimir, the winner of the Westphalian free-jumping competition in 2013. At the sport foal auction in Ruswil/SUI, the colt Corlinsky was sold for 25.000,- Swiss Francs. Congress was born with exceptional jumping talent. The sire Cornet Obolensky, which is at stud at our stallion station, is a foundation stallion of modern show jumping breeding and ranked as the youngest stallion amongst the top ten of the most successful show jumping progenitors, according to the WBFSH (World Breeding Federation for Sport Horses). Cornet Obolensky was successful in sports, winning the Team Gold Medal at the European Championships in Madrid/ESP. The dam state premium/elite mare Grannuschka, a full sister to the licensed and with Franke Sloothaak internationally successful Gio Granno, produced 4 licensed sons. Bred to Contender she produced the 1stOldenburg reserve champion Conterno Grande, which won the Grand Prix of Nörten-Hardenberg, Bremen und Mechelen/BEL with Marco Kutscher and Philipp Weishaupt. Bred to Cordalmé Z Grannuschka produced the premium sire Couleur Rubin, which won, ridden by Ludger Beerbaum, the Championat of Basel/SUI and the Nations Cup in La Baule/FRA. He placed second in the Masters League-Finale in Frankfurt and in Mannheimer Badenia, as well as third in the Grand Prix of Neumünster and in the Top Ten Finals in Genf/SUI etc. Couleur Rubins younger full brother Couleur Rouge became Ih-premium sire of the Oldenburg licensing in Vechta 2004. In 2006 he became Landeschampion of the four year old show jumpes. After that Couleur Rouge achieved wins and placings in young horse show jumping competitions up to intermediate level/M level. From Harli Seifert´s performance line of the mare Rudilore came the licensed and up to Grand Prix Dressage victorious stallions Rubin Royal OLD/Hendrik Lochthowe, Glock’s Romanov/Hans Peter Minderhoud/NED and Rubin Action/Stella Charlott Roth as well as Rubino Vincento, Rumicello, Rockefeller, Chaccomino, Don Chico and Tantris and the sporthorses Campo Grande, A Special Delight, The Ritz R&B und Famaso, of which some were placed internationally. Congress und Marie Ligges in der Finalprüfung der Junioren Deutsche Meisterschaften Zeiskam 2014.